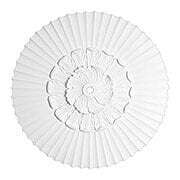 A simple yet elegant leaf pattern makes this small ceiling accent compatible with most decorative lighting or can be used to liven up a plain light. The 1" center hole will allow mounting with almost any chandelier or pendant light with a stem smaller than 1" around. 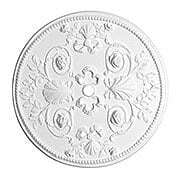 This small size light fixture ceiling accent uses gracefully flowing leaves with beaded borders to compliment Colonial Revival, Victorian or other decorative styles. The 1" center hole will allow mounting with almost any chandelier or pendant light with a stem smaller than 1" around. 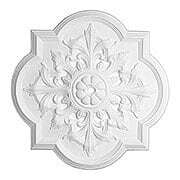 This small size light fixture ceiling accent has a complex fleur-de-lis pattern to coordinate well with Classical, Victorian or other decorative styles. The 1" center hole will allow mounting with almost any chandelier or pendant light with a stem smaller than 1" around. 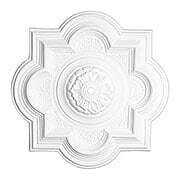 A simple repeating pattern of overlapping leaves makes this medium size ceiling accent compatible with most decorative lighting or can be used to liven up a plain light. 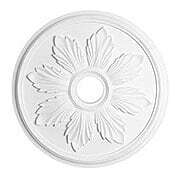 The 1" center hole will allow mounting with almost any chandelier or pendant light with a stem smaller than 1" around. A simple yet elegant leaf pattern makes this large ceiling accent compatible with most decorative lighting or can be used to liven up a plain light. The 1" center hole will allow mounting with almost any chandelier or pendant light with a stem smaller than 1" around. A simple yet elegant leaf pattern makes this medium ceiling accent compatible with most decorative lighting or can be used to liven up a plain light. The 1" center hole will allow mounting with almost any chandelier or pendant light with a stem smaller than 1" around. A simple yet elegant leaf pattern makes this ceiling accent compatible with most decorative lighting or can be used to liven up a plain light. 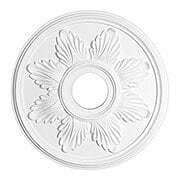 The 4" center hole on this medium sized medallion will allow mounting with almost any chandelier, pendant or semi-flush fixture with a canopy larger than four inches. 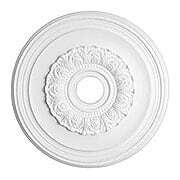 With its arched sides and leaf designs this large size light fixture ceiling accent will work with many Federal, Colonial Revival and Victorian styles. The 1" center hole will allow mounting with almost any chandelier or pendant light with a stem smaller than 1" around. 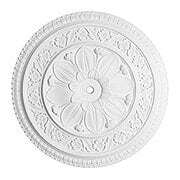 This medium size light fixture ceiling accent is designed with a combination of cherubs and flowers to go with Neo-Classical, Victorian or other decorative styles of lighting and interiors. 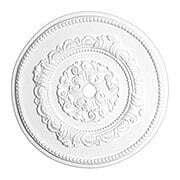 The 4" center hole on this small medallion will allow mounting with almost any chandelier, pendant or semi-flush fixture with a canopy larger than four inches. 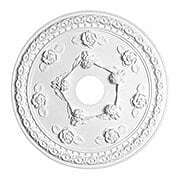 This medium size light fixture ceiling accent has a beautiful geometric pattern with leaves and flowers which matches up well with Colonial Revival, Victorian, and other decorative styles. The 1" center hole will allow mounting with almost any chandelier or pendant light with a stem smaller than 1" around. 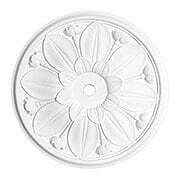 This medium size light fixture ceiling accent has beautiful geometric patterns of leaves and flowers which coordinate well with Victorian or other decorative styles. The 1" center hole will allow mounting with almost any chandelier or pendant light with a stem smaller than 1" around. 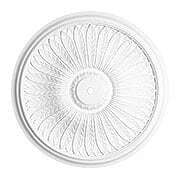 The Lotus medium size light fixture ceiling accent has beautiful geometric patterns of leaves and flowers which coordinate well with Colonial Revival, Victorian, Arts and Crafts or other decorative styles. The 1 inch center hole will allow mounting with almost any chandelier or pendant light with a stem smaller than 1 inch around. 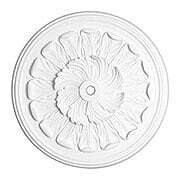 The Lotus small size light fixture ceiling accent uses a geometric pattern of large leaves and flowers to coordinate well with Colonial Revival, Victorian, Arts and Crafts or other decorative styles. The 1 inch center hole will allow mounting with almost any chandelier or pendant light with a stem smaller than 1 inch around. 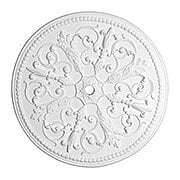 This small size light fixture ceiling accent has intricate rope and flower motifs to coordinate well with Federal, Victorian or other decorative styles. 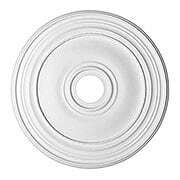 The 4" center hole will allow mounting with almost any chandelier, pendant or semi-flush lighting with a canopy larger than four inches. 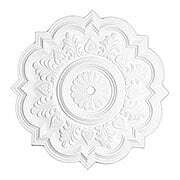 This medium size light fixture ceiling accent has intricate rope and flower motifs to coordinate well with Federal, Victorian or other decorative styles. 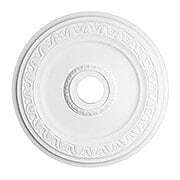 The 4" center hole will allow mounting with almost any chandelier, pendant or semi-flush lighting with a canopy larger than four inches. 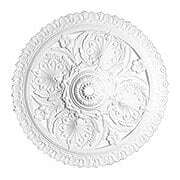 This large size light fixture ceiling accent has intricate rope and flower motifs to coordinate well with Federal, Victorian or other decorative styles. 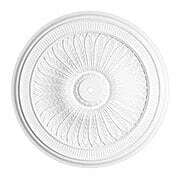 The 4" center hole will allow mounting with almost any chandelier, pendant or semi-flush lighting with a canopy larger than four inches.